New Delhi : Narayan Seva Sansthan - a non- profit organization organized the ‘International Award Ceremony 2018’ to felicitate the contribution of the donors who have supported Narayan Seva Sansthan in its motivational journey of serving the ‘differently able’ individuals. 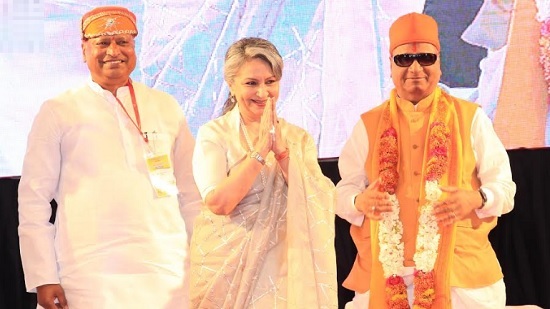 The award ceremony was a gala event with renowned bollywoodactress Sharmila Tagore and television star Dilip Joshi, in presence of the president of Narayan Seva Sansthan – Prashant Agarwal. The awards were conferred in various categories viz. Platinum, Diamond, Gold, silver and Bronze to over 100s of donors from all across the globe, who havesupported in transforming lives of 15000 ‘differently able’ waitlisted patients. Prashant Agarwal, President of Narayan Seva Sansthan shared, “Narayan Sansthan is a Smart Village with all the facilities for the physically incapable humans who feel deprived in any way, at any stage of life. Narayan Seva Sansthan has operated over 3.5 lakh patients in last 30 years and has provided them a full socio-economic support by availing best of the medical services, medicines, and technology in free. Narayan Seva Sansthan has 1100 bedded hospital facility, which does not only cure the differently able individuals but also provides them social and economical rehabilitation. Narayan Seva Sansthan is the hope of polio, Cerebral Palsy, Lymphatic Filariasis patients belonging from India, Afghanistan, Pakistan, Nepal, Bangladesh, Ukraine, UK and USA. Daily thousands of patients are served in this smart village ‘Badi’ in Udaipur, Rajasthan. There is no Cash Counter or Payment Gateway for the patients coming to Narayan Seva Sansthan for any Physical, Social and Economic rehabilitation. Physiotherapy, Calipers, Modular Equipments, Tricycle, Wheelchair, Limbs and many other modern types of equipments are provided free of cost. Moreover, Narayan Seva Sansthan arranges operations and treatments of diseaseslike blood cancer, kidney transplant, heart in the other best hospitals and by taking care of the expenses on behalf of patients. It gives over 25000 calipers and about 11000 modular artificial limbs every year to the patients. So far, the organisation has donated about 7.95 Lakh wheelchairs and about 2.59 Lakh Tricycles. Narayan Seva Sansthan’s founder believes, making patients physically fit is not enough, to make them more confident and self-reliant we must change their perspective towards life. For this concern the organization runs computer courses, mobile repairing courses, sewing courses and many such vocational training courses in free to make them self-reliant. Patients are also helped in job placements after they are fit to go back to their home. Whoever wants to start his/her own business gets sewing machine, tool kit or any such help in free from the Narayan Seva Sansthan. Narayan Seva Sansthan has organised about 30 mass marriage programs and have arranged marriages of over 1500 differently able couples. It also organises national swimming competition, fashion and talent shows for the differently able. Narayan Seva Sansthan constantly aiming at the Physical, Social and Economic rehabilitation of the differently able individuals has achieved new heights. Established in 1985, it has been providing free of cost treatment tomillions of peopleaffected by polio and other 'by birth' disabilities through corrective surgeries.